The magnocellular tract plays an important role in posture. It provides visual information that allows for spontaneous adjustment of posture and muscle tone as the environment changes. Integration of vestibular information with this visual information helps keep us stable when are moving. Think of standing on a boat gently pitching to and fro on the water. As the boat rock, the muscles of ones legs, trunk, and neck all compensate and adjust to allow you to stay standing. Imagine how hard it would be to do this if one were blindfolded. It would be much more difficult if the brain was unable to get accurate data about the changes in horizon and the incoming waves. SMPD is one of the subtypes of sensory dysfunction described by the Star Institute. Marked by postural weakness and decreased stamina (what we may have described previously as “low tone”), these children have difficult times sitting up tall and may demonstrate a head-forward, flexed posture with shoulder rolled forward and possible scapular winging. They may have weak hands and present to OT for difficulty with handwriting or visual motor integration. In optometry, they call this postural dysfunction or other terms. The link between posture and vision is very important. 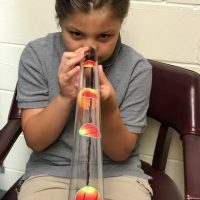 Decreased visual acuity or decreased magnocellular awareness can cause the brain to get poor information about the body’s position in space and not allow for appropriate muscular corrections as the environment changes and the child moves. The vestibular system as well requires visual input to allow for correct adjust adjustment of posture. We might observe this as a clumsy child or a child with weak posture. 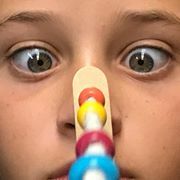 As therapists, it is important that we make sure our young patients have a full and complete eye exam as we begin to address postural weakness, visual motor integration and handwriting problems. An uncorrected visual system will make treatment very difficult. But an appropriate visual system becomes a powerful tool to help correct these problems. It is possible to make use of the powerful magnocellular system to help with posture. The addition of prism or binasal occulsion during a typical treatment for postural problems and “low tone” can alter the perception of visual space. Base down prism will shift visual space upward, making the head go up. When the goes up, the trunk moves into more extension. The brain quickly makes adjustment to the body based on the altered visual space. I continue to find children with a full team of professionals: PT, OT SLP, ABA, pediatricians, etc, that have not had an eye exam. Know the ODs in your town that perform comprehensive binocular vision exams and make sure your kiddos can see !! This entry was posted in occupational therapy, pediatric, vision rehabilitation and tagged ADD, ADHD, balance, gait disfunction, neuro-optemetric rehabilitation association, postural dysfunction, sesnory dysfunction, sesnory modulated postural dysfunction, toe walking, visual motor integration. Bookmark the permalink.